CVGHM reported that on 6, 10, and 12 June, and during 14 June-9 July, the color of the water in Kelimutu’s Crater II (Tiwu Nua Muri Kooh Tai Crater) was bluish white. Diffuse white plumes rose as high as 50 m above the lake’s surface and in some areas the water appeared or sounded like it was boiling. A sulfur odor was also reported. The water in Crater I (Tiwu Ata Polo) was light green and churned, and the water in Crater III (Tiwu Ata Mbupu) was mossy green. During 22-29 June sulfur dioxide concentrations from Crater II were occasionally detected at 2.8 ppm, when the wind blew the gas towards the sensor. CVGHM noted that plumes rising from the lakes became lower and barely visible during 3 June-9 July, and that the “rustling sound” of water from near the dividing wall of craters I and II gradually faded away. Based on visual observations, seismicity, and gas emissions, CVGHM lowered the Alert Level to 1 (on a scale of 1-4) on 12 July. This volcano is well known for three summit crater lakes, each a different color. We last reported minor bubbling in a crater lake Tiwu Nua Muri Kooh Tai lake in 1995 (BGVN 20:06). Between 15 and 19 May 1995, rescuers searched for the body of a Dutch tourist who had fallen into the crater lake but they did not find it. 2013 activity.The Center of Volcanology and Geological Hazard Mitigation (CVGHM) reported that on 6, 10, and 12 June 2013, and during 14 June-9 July 2013, the color of the water in Kelimutu's Crater II (Tiwu Nua Muri Kooh Tai Crater) was bluish white. Diffuse white plumes rose as high as 50 m above the lake's surface and in some areas the water appeared or sounded like it was boiling. A sulfur odor was also reported. The water in Crater I (Tiwu Ata Polo) was light green and churned, and the water in Crater III (Tiwu Ata Mbupu) was mossy green. On 3 June 2013, a change was observed in the color of the lake water in Crater II, going from blue to a café au lait (light tan), accompanied by white smoke under weak to medium pressure, rising 50 meters above the surface of the lake. From the southern side of Crater II a bubbling sound of boiling was heard near the wall separating Crater I from Crater II. The smell of sulphur gas was quite sharp in the vicinity of the crater and at nighttime a weak to medium smell of this gas could be discerned in Pemo Village which is 3 kms from the peak of Kelimutu. On 4 June 2013 at 1400 hours local time the status of Kelimutu was upgraded from Alert Level 1 (Normal) to Alert Level 2 (Waspada). On 6 June 2013 water in Crater II was a bluish white (like a salty egg), with sparse to medium white smoke under weak to strong pressure extending up 10-35 meters above the lake surface. A weak to strong bubbling sound of boiling water was heard on the southern side of the crater. A medium to sharp smell of sulphurous gas was evident as was the withering vegetation. On 10 June 2013 water in Crater II was still a bluish white with medium to dense white smoke extending up 40-50 m above the lake surface. A bubbling sound of boiling water could be heard on the southern side of the crater. A medium smell of sulphurous gases was discernible. On 12 June 2013, smoke rising from the surface of the lake extended to only about 10-30 meters above the lip of the crater. There was a rather acrid smell of sulphurous fumes. Eruptive and hot air noises were audible two times and the water in the crater lake still appeared to be boiling. From 14 June to 9 July 2013, water in Crater II visually still appeared bluish white with sparse white smoke rising from the surface of the lake about 2-10 meters into the atmosphere (dominant height was not observed). There was a weak to medium (with weak dominating) smell of sulphurous gases. At one point bubbling water was noticeable but it was clearly under weak pressure. Water from Crater III was calm and moss-green in color. During 22-29 June 2013 sulfur dioxide concentrations in Crater II were occasionally 2.8 ppm, when the wind blew the gas towards the sensor. CVGHM noted that plumes rising from the lakes became lower and barely visible during 3 June-9 July, and that the hissing or "rustling sound" of water from near the dividing wall of craters I and II had gradually faded away. Based on visual observations, seismicity, and gas emissions, CVGHM lowered the Alert Level to 1 (on a scale of 1-4) on 12 July (figure 4). Figure 4. 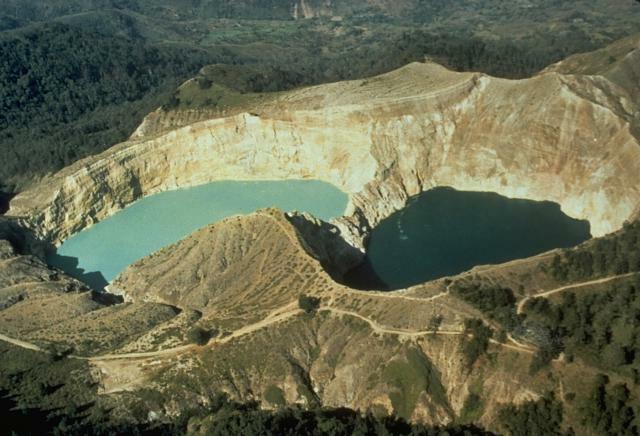 Kelimutu has three summit crater lakes seen in this photo. The lake Tiwi Ata Mbupu (left) is commonly blue. Tiwu Nua Muri Kooh Tai and Tiwu Ata Polo, which share a common crater wall, are typically green and red-colored, respectively. Photo courtesy of https://www.tripping.com. Posted 1 June 2013. During 13 - 18 June 2013, local tectonic quakes peaked at 139 before undergoing a decrease as of 17 June 2013. Shallow (VB) and deep (VA) volcanic earthquakes occurred intensely each day, reaching a a peak of 13 shallow volcanic quakes 19-24 June 2013 and then tended to decline (figure 5). Deep volcanic quakes peaked at 14 during 1-6 July 2013 and then subsided. Figure 5. A plot of seismicity at Kelimutu during 1 June 2013 through 11 July 2013. Courtesy of CVGHM. No thermal alerts were recorded by MODVOLC for the past twelve months beginning in mid-July 2012. Figure 6. First photo (A) is Tiwu Ata Polo Lake (water color change from red to green), second photo (B) is between Tiwu Ata Polo Lake and Tiwu Nua Muri Kooh Fai Lake, and third photo (C) is Tiwu Nua Muri Kooh Fai Lake (water color change from green to white). Pictures taken on 6 June 2013 by Kristianto. Information Contacts: Center of Volcanology and Geological Hazard Mitigation (CVGHM), Jalan Diponegoro 57, Bandung 40122, Indonesia (URL: http://www.vsi.esdm.go.id/); and Hawai'i Institute of Geophysics and Planetology (HIGP) MODVOLC Thermal System, School of Ocean and Earth Science and Technology (SOEST), Univ. of Hawai'i, 2525 Correa Road, Honolulu, HI 96822 USA (URL: http;//hotspot.higp.hawaii.edu/). CVGHM reported that on 3 June the water in Kelimutu’s Crater II (Tiwu Nua Muri Kooh Tai Crater) turned from blue to a light brown color, “smoke” rose 50 m above the crater, “rustling water sounds” were heard near the wall of Crater I (Tiwu Ata Polo), and a sharp sulfur odor was noted. That evening a weak sulfur odor was reported in Pemo (3 km). Plants within 2 km S and SE appeared to have wilted. Based on seismicity from 20 May-2 June and visual observations on 3 June, CVGHM raised the Alert Level to 2 (on a scale of 1-4), and warned the public not to approach the craters within a radius of 2 km and to avoid river valleys. ". . . signs of unrest from the Tiwu Nua Muri crater . 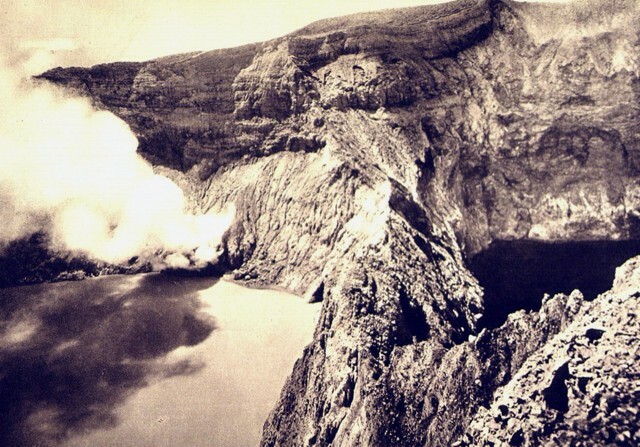 . . consisted of increased gas bubbling from the crater lake beginning on 27 April and a felt earthquake on 28 April." Information Contacts: Olas, Suratman, Suparto, Kaswanda, and A. Sudradjat, VSI. In November, moderate degassing with a weak sulfur odor occurred from the the E crater's Tiwu Ata Polo, reddish in 1986 and dark green in 1989. No degassing was evident from the light green Tiwu Nua Muri Kooh Tai in the central crater. A small amount of sulfur was deposited around the lakeshore. In the W crater, Tiwu Ata Mbupu, dark brown in May, was greenish in November. No degassing or other activity was evident. Fumaroles on the upper flanks had temperatures of [96-97°C] in 21°C air. An earthquake was felt at MM II on 28 June at 2255. November seismicity included [three] A-type and [two] B-type events, plus  local and  distant tectonic earthquakes. Reference. Volcanological Survey of Indonesia, 1993a, Kelimutu Volcano: Journal of Volcanic Activity in Indonesia, v. 1:1/2, p. 14. 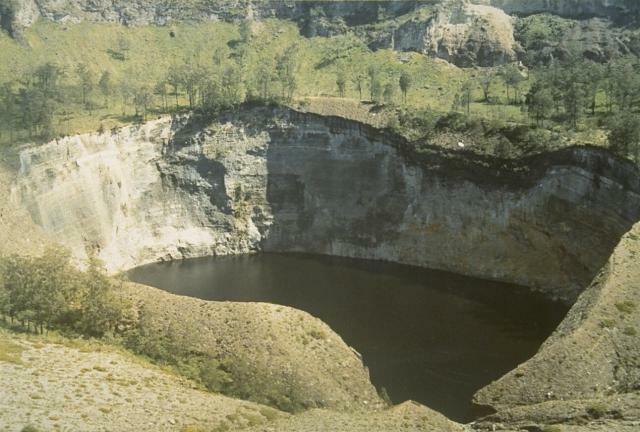 Between 15 and 19 May 1995 a search was conducted for the body of a missing Dutch tourist who had fallen into one of Kelimutu's three crater lakes (figures 1, 2, and 3). During the search of the turquoise-blue Tiwu Nua Muri Kooh Tai lake, ~600 x 380 m in size and located 100-150 m below the crater rim, pH measured by litmus-paper was 0.5. Access to the crater lake was achieved by rope-aided descent, but rocks on the crater wall were very loose and rockfalls were frequent. A portable boat was used to tow a dredging net to comb the 3-6 m depth range of the entire lake. The water temperature was 37°C, ~8° cooler than the air. A film of yellow sulfur (~30 x 150 m) floated on the lake's surface. The searchers breathed bottled oxygen because of the high levels of SO2 in the air, which measured 5 ppm. On 18 May "little bubbles or very small fountains" were observed within the lake. Although the body was not recovered, the search was terminated on 19 May. Figure 1. Map of the summit area of Kelimutu showing the three crater lakes and the location of the volcano observatory. Figure 2. 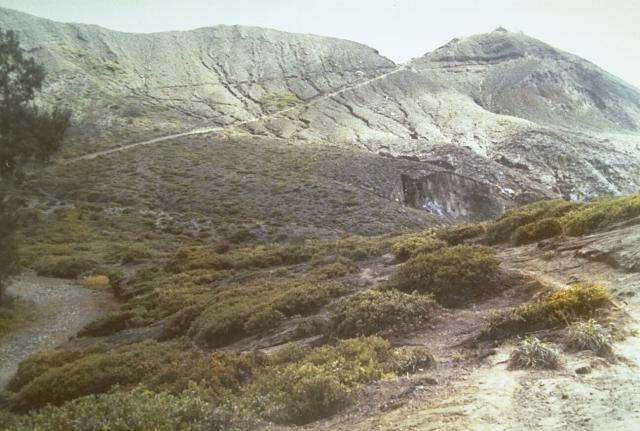 Kelimutu summit area in mid-May 1995, view is to the SE. The turquoise-green Tiwu Nua Muri Kooh Tai crater lake is in the foreground (~600 x 380 m) with the darker-colored Tiwu Ata Polo crater lake behind it to the right. Photograph courtesy of Ton Biesemat, Outdoor Magazine. Figure 3. Crater lakes at Kelimutu, mid-May 1995. View is approximately WSW looking along the heavily altered shared crater rim between the turquoise-green Tiwu Nua Muri Kooh lake (right) and the dark Tiwu Ata Polo lake (left). Photograph courtesy of Ton Biesemat, Outdoor Magazine. Further Reference. Outdoor Magazine, Bergingsactie op een actieve vulkaan, De Kelimutu Zwijgt, 3e jaargang:4, July 1995, p. 40-45 (in Dutch, with 14 photos). Information Contacts: Ton Biesemaat, Outdoor Magazine, Netherlands; VSI; AP; UPI. Kelimutu is a small, but well-known, Indonesian compound volcano in central Flores Island with three summit crater lakes of varying colors. The western lake, Tiwi Ata Mbupu (Lake of Old People) is commonly blue. Tiwu Nua Muri Kooh Tai (Lake of Young Men and Maidens) and Tiwu Ata Polo (Bewitched, or Enchanted Lake), which share a common crater wall, are commonly colored green and red, respectively, although lake colors periodically vary. Active upwelling, probably fed by subaqueous fumaroles, occurs at the two eastern lakes. The scenic lakes are a popular tourist destination and have been the source of minor phreatic eruptions in historical time. The summit is elongated 2 km in a WNW-ESE direction; the older cones of Kelido (3 km N) and Kelibara (2 km S). Kemmerling G L L, 1929. Vulkanen van Flores. Vulk Seism Meded Dienst Mijnw Ned-Indie, 10: 1-138. Pasternack G B, Varekamp J C, 1994. The geochemistry of the Keli Mutu crater lake, Flores, Indonesia. Geochem J, 28: 243-262. Sudradjat A, 1977. (pers. comm.). van Bemmelen R W, 1949. The Geology of Indonesia. The Hague: Government Printing Office, v 1, 732 p.
There is no Deformation History data available for Kelimutu. There is no Emissions History data available for Kelimutu. 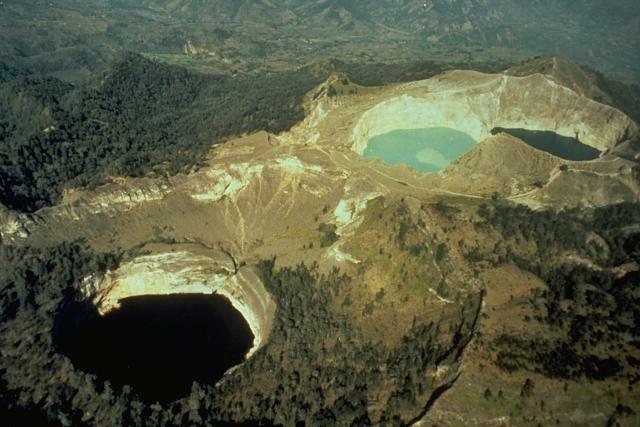 A double crater lake of Kelimutu volcano on Indonesia's Flores Island is seen in this aerial view from the SW. Tiwu Nua Muri Kooh Tai (Lake of Young Men and Maiden) on the left and Tiwu Ata Polo (Bewitched, or Enchanted Lake) are separated by a narrow septum about 35 m high. Phreatic eruptions have occurred from Tiwu Nua Muri Kooh Tai in the 19th and 20th centuries, and continuous upwelling occurs at both lakes. Kelimutu, a small volcano on Flores Island, is noted for its three crater lakes of different colors. This aerial view from the SW shows Tiwu Ata Mbupu (Lake of Old People) at the lower left, and the double craters of Tiwu Nua Muri Kooh Tai (Lake of Young Men and Maiden) and Tiwu Ata Polo (Bewitched, or Enchanted Lake) at the upper right. Water color varies periodically, but is often blue, green, and red, respectively. Phreatic eruptions have occurred from the middle lake in historical time. Photo by Tom Casadevall (U.S. Geological Survey). The SE-most pair of Kelimutu's renowned crater lakes, Tiwu Ata Polo and Tiwu Nua Muri Kooh Tai are seen here in an aerial view from the SE. A light-colored area of upwelling can be seen in the upper lake and also occurs in the lower one. A third lake lies in a crater behind the trail at the left-center of the photo. The variable colors of the three lakes produce one of Indonensia's most noted sights. All three lakes are close to saturation with gypsum/anhydrite. Photo by Tom Casadevall, (U.S. Geological Survey). The WNW-most of three craters on Kelimutu volcano is 850 x 600 m wide and contains a steep-walled inner crater occupied by Tiwu Ata Mbupu, a 67-m-deep crater lake. The shoreline of the lake is coated with red/yellow incrustations and gypsum crystals. Lake color tends to vary seasonally. Steep walls of the middle of Kelimutu's three renowned crater lakes, Tiwu Nua Muri Kooh Tai ("Lake of Young Men and Maidens"), expose bedded hydrothermally altered rocks. A narrow septum separates this lake from its darker colored twin to the SE, Tiwu Ata Polo ("The Bewitched Lake," or "Enchanted Lake"). 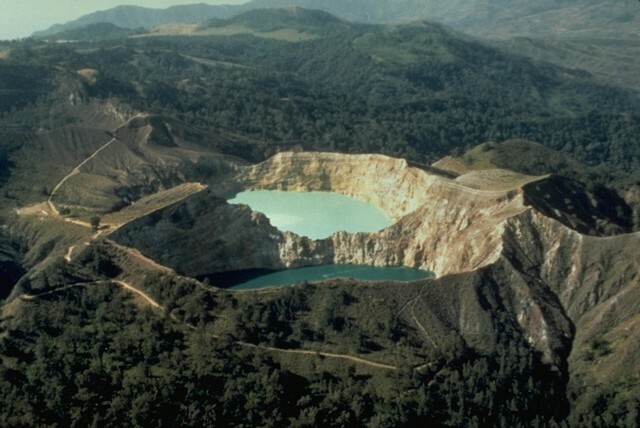 Constant upwelling occurs at these two lakes, probably as a result of subaqueous fumaroles. The vigorous upwelling drives floating sulfur in Tiwu Nua Muri Kooh Tai toward the crater walls. 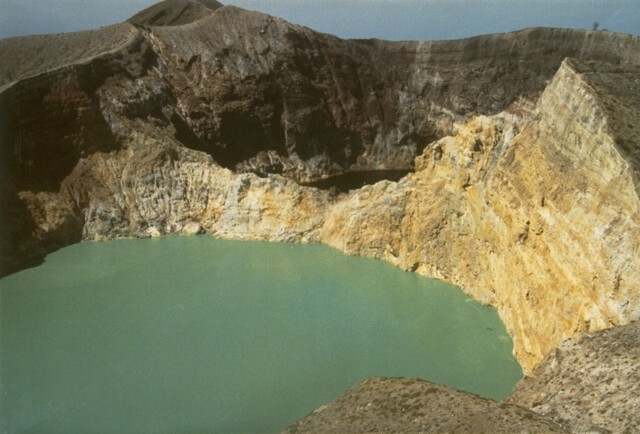 The summit of Kelimutu volcano is elongated 2-3 km in a WNW-ESE direction and contains three crater lakes. A trail ascending the eastern wall of the WNW-most cone leads to Tiwu Ata Mbupu crater lake. A steam column rises above a fumarole on the crater wall of light-colored Tiwu Nua Muri Kooh Tai lake. A knife-edged ridge separates the crater lake from dark-colored Tiwu Alta Polo lake (right), the easternmost of the double craters. These dramatic crater lakes are among the most visited sites on Flores Island. Photo by E. Weissenborn (published in Kemnerling 1929, "Vulkanen van Flores," courtesy of Volcanological Survey of Indonesia). There are no samples for Kelimutu in the Smithsonian's NMNH Department of Mineral Sciences Rock and Ore collection. Large Eruptions of Kelimutu Information about large Quaternary eruptions (VEI >= 4) is cataloged in the Large Magnitude Explosive Volcanic Eruptions (LaMEVE) database of the Volcano Global Risk Identification and Analysis Project (VOGRIPA).